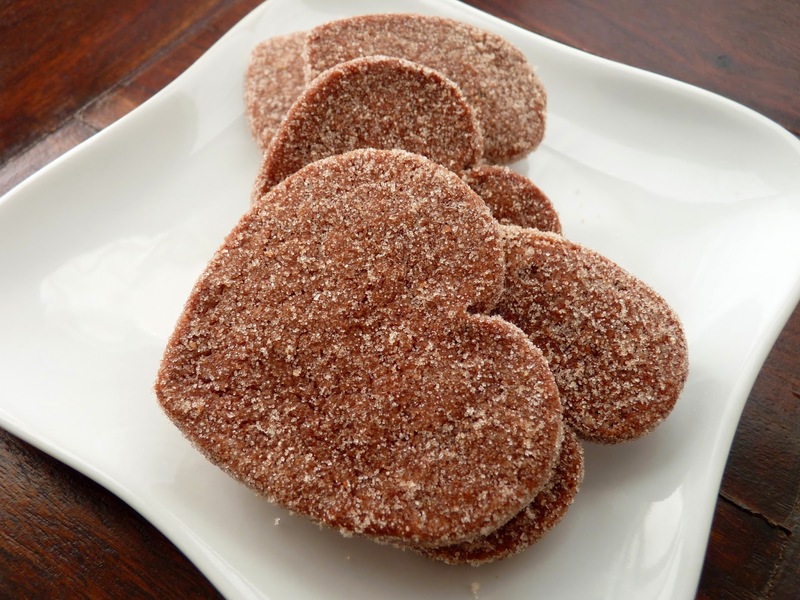 Among the heart-shaped cookies, candies and cakes proliferating this time of year, one of my favorites is this Mexican chocolate shortbread cookie. I can never resist the introduction of spice in pastry, so I put together a cookie that celebrates the lovely marriage of chocolate and spice with just a hint of chile. The use of the heart as a metaphor to express romantic love and affection comes from the Middle Ages and the days of Chaucer. It was more directly popularized in the 19th century as a symbol for Valentine’s Day, which originated with the Feast of Saint Valentine, named for Valentinus, a Christian saint who performed weddings. And let’s not forget Cupid, the son of Venus and the Greek god of attraction, whose arrows contain the prospect of uncontrollable desire. Since chocolate, in all its refined sumptuousness, has come to evoke endless desire in our day, it seems appropriate that it, too, is a central part of our modern profession of love. This cookie contains a good amount of cocoa, a measure of sweetness and enough butter to create a crispy, crumbly expression of love, no doubt a suitable object of desire. - This recipe calls for Dutched cocoa powder, which has a milder flavor, but I've also used natural cocoa powder. 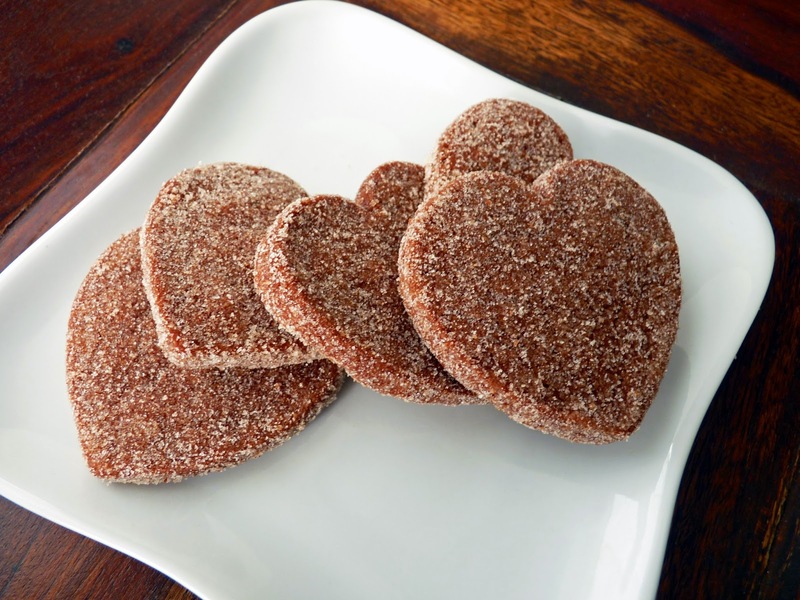 - I use a 2 1/2” heart-shaped cookie cutter but use any shape or size you wish. The yield may be different. Just keep the size uniform so they bake evenly and keep a close eye on the baking time if they are much smaller. - Be careful not to overbake or the cookies will take on a bitterness. 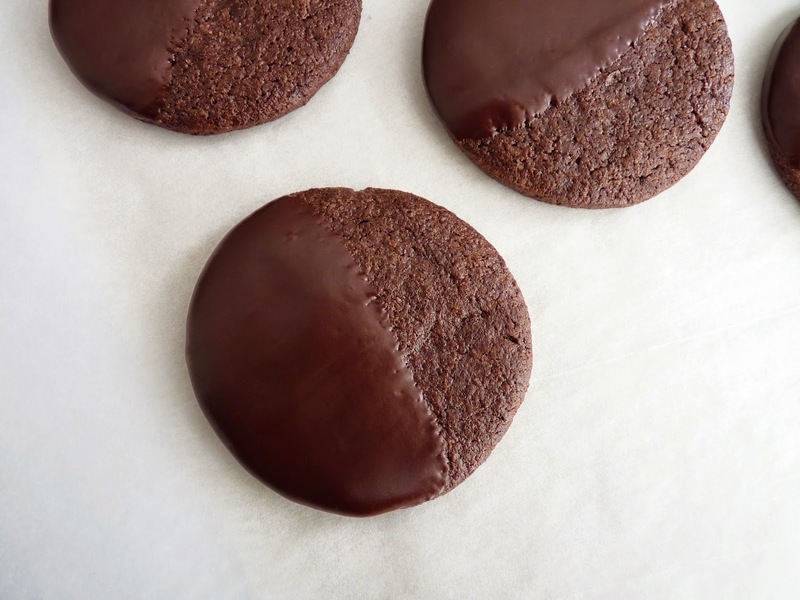 Test for doneness by lightly nudging the side of a cookie with your fingertip. If it moves without resistance, it’s done. If you prefer, coat the cookies in sugar after removing from the oven and cooling a couple of minutes so you can see more clearly see how they’re baking. Or bake one first as a test to see how long it takes to bake in your own oven. - If you enjoy Mexican chocolate flavors, try rich and creamy Mexican Chocolate Ice Cream. Whisk flour, cocoa, salt and spices together. Beat the butter, sugar, and vanilla and almond extracts until creamy and smooth but not fluffy, about 1 minute. Add the flour mixture and mix just until incorporated. Be careful not to overmix. Scrape the dough onto a sheet of plastic wrap. Cover with another sheet of plastic wrap and flatten the dough. Roll it into an even, flat 1/4” thick disc. Slide onto a baking sheet or pizza pan and chill until firm, at least 2 hours or overnight. Preheat oven to 325 degrees F. Line baking sheets with parchment or silpats. Combine 1/2 cup sugar with a good pinch of cinnamon. Peel off the plastic wrap from both sides of the cookie dough. 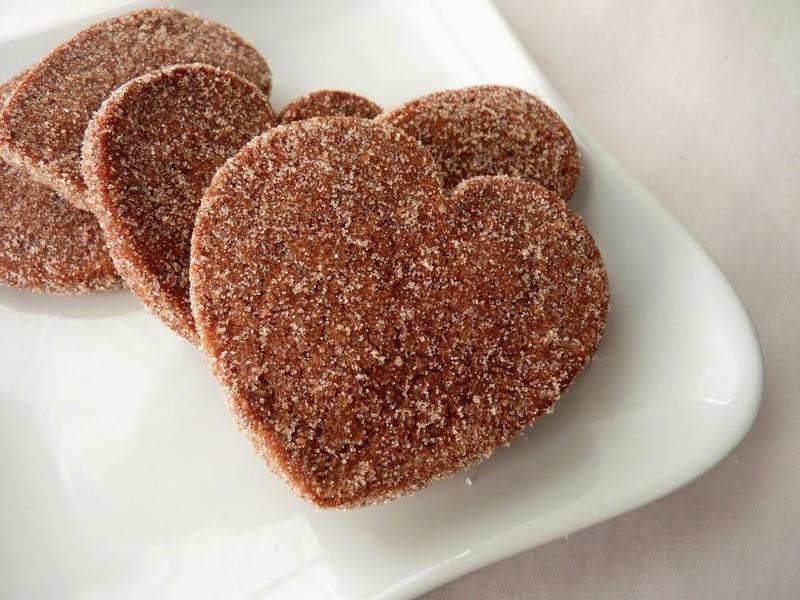 Cut out heart shaped cookies and dip them in cinnamon sugar to coat evenly. Place on the baking sheet. Bake in lower third of the oven for 20 - 22 minutes. Cool pan on a wire rack. There are people who love cake but don’t like the commitment of baking one at home. Sometimes too much cake on hand can be a problem. Maybe that’s how and why cookies were invented? And certainly that’s where madeleines come in. 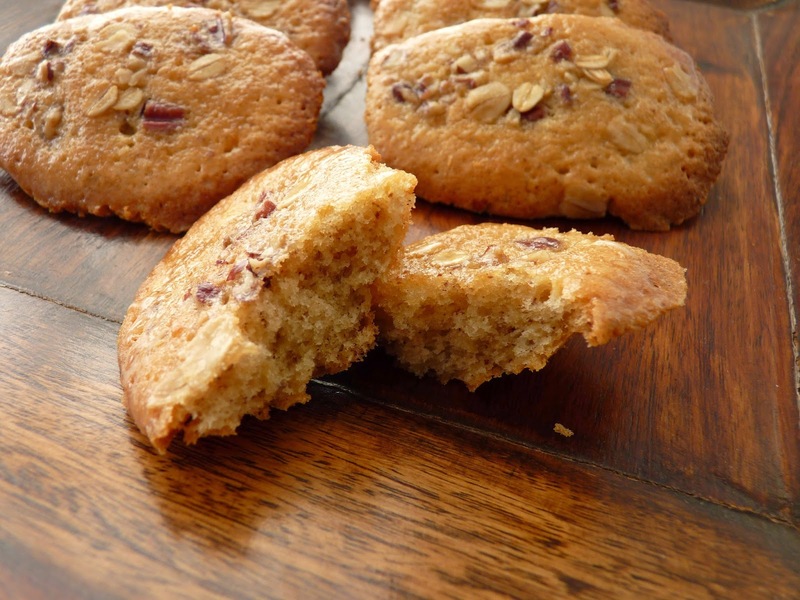 They’re considered both a cookie and a wee little cake, a bit like financiers, chewy little nut cakes made with browned butter. Leave it to the French. Madeleines are prepared in the génoise sponge cake tradition and are usually offered at tea time. The tiny edges of the cakes are crispy while the interior is soft and spongy. 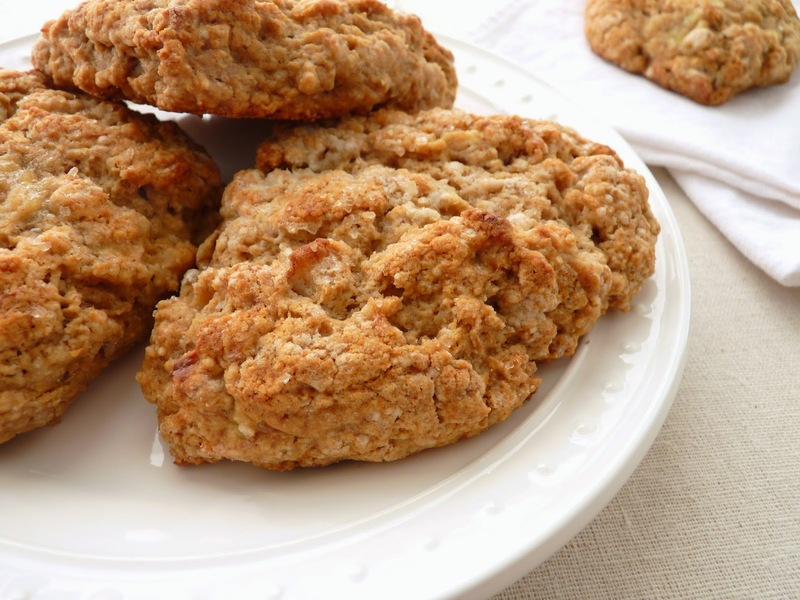 In this version, I’ve used oats and pecans finely ground with flour for a more interesting texture and flavor. And just because maple goes so well in this crowd, I added a taste of that as well. I think it may have been a subliminal moment of granola worship. Since these only bake for 12 – 14 minutes or so, the oatmeal needs to be ground as finely as possible in a food processor so it blends with the flour. Even so, there’s a whole grain-ish bite to them. And just as they come out of the oven, I brush them lightly with a mixture of maple and butter to fortify the flavor. Next time you long for a tiny cake with your warm beverage, try these madeleines. And if they make too many to harbor in your household, do pass them around. - The eggs and sugar are beaten to the “ribbon stage,” which is a method of using a whisk to beat air into the mixture until thickened and tripled in volume. You can test for the ribbon stage by stopping and lifting the whisk. The batter should stream down from the whisk and form a cascading ribbon on the surface of the batter that holds for a few seconds. I usually lift the beater about 6" and scrawl out my initials. If they hold for a moment by the time I've finished, it's ready. I use a stand mixer. If you're using a hand mixer, it will take a bit longer to get the eggs and sugar to the ribbon stage. - For a light salty edge, use a slightly mounded 1/4 teaspoon of salt. Preheat oven to 375 degrees F. Generously butter one madeleine mold pan and eight wells in a second pan. Lightly dust with flour. 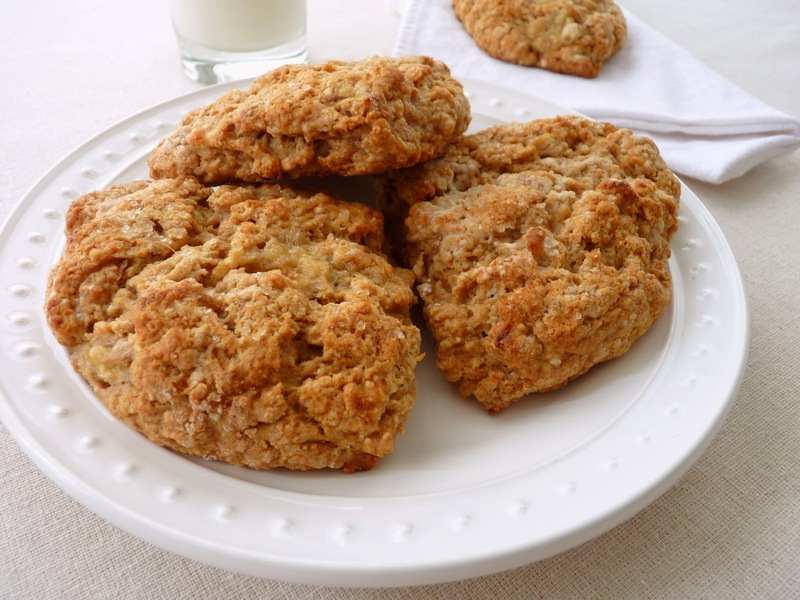 Place the flour, oats, pecans, baking powder, salt and pinch of nutmeg in the bowl of a food processor. Process until the oats are finely ground. Melt the butter with the maple syrup and set aside to cool. Whisk the eggs and sugar on high speed until thickened and the batter falls in ribbons when whisk is lifted, about 5 minutes. Add vanilla and blend. Fold in the flour mixture by hand with a rubber spatula in 3 additions. Fold in one-third of the butter mixture until combined. Fold in another third until blended and then fold in the remainder. Scoop the batter into the wells of prepared madeleine pans. 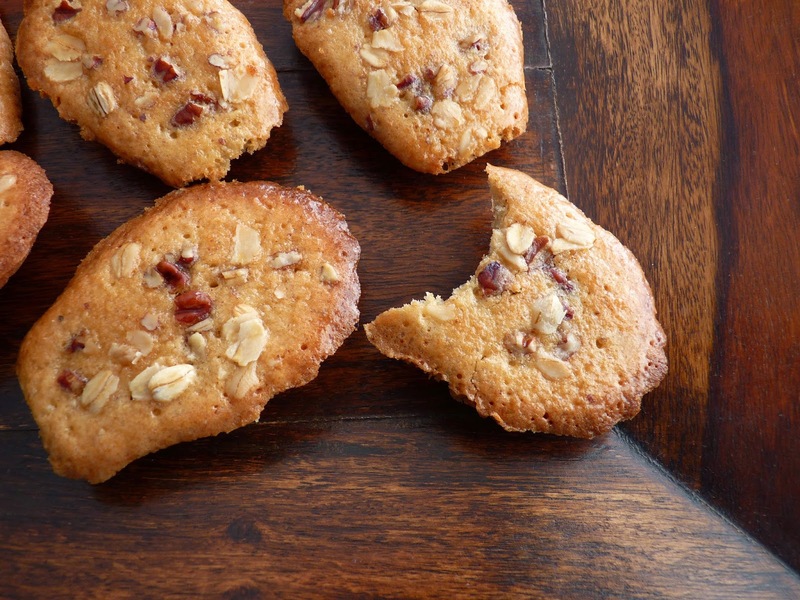 Garnish each one with a pinch of oats and pecans. Bake until the cakes spring back when touched, about 12 – 13 minutes. Remove from the oven and let them cool for 1 minute, then tilt the pans to dislodge them. Melt the 3/4 oz butter and the 1 1/2 tablespoons maple syrup together. Stir to combine and brush on the garnished side of each madeleine. Cool completely. I happened to see an article a few days ago about 3 new cookies the Girl Scouts have added to their collection: Toffee-tastic, a butter cookie with toffee bits that’s gluten-free; Rah-Rah Raisins, an oatmeal cookie with raisins and Greek yogurt chunks; and Trios, a peanut butter oatmeal cookie with chocolate chips that's gluten-free. I also happened to read a piece about how the threat of crop pests or new disease along with our outsized demand for chocolate is making it difficult for suppliers to keep up with our habit. So imagine a world without chocolate. OK, had enough? Here’s hoping that good precautions and robust crops will avert a chocolate crisis. Yikes. Anyway, all this news about Girl Scout cookies and worries about chocolate production reminded me how much I like the combination of chocolate and mint, so I set about to make some Chocolate Mint Cookies. These are simple cookies with ordinary ingredients in good combination to make when you want a tinge of cookie fun - a little bit of cookie, a little bit of chocolate and a little blast of mint. - You can re-roll scraps. Just layer them as you go rather than gathering them up and squishing them into a ball. - Cookie dough is much easier to handle and cut when thoroughly chilled. They also hold their shape better. - The cookies aren't super sweet so I suggest semisweet chocolate for coating. Finely chop the chocolate so it melts evenly and quickly without overheating. - When melting chocolate, the water in the bain marie should be barely simmering. When chocolate gets too hot, it becomes grainy and may seize. 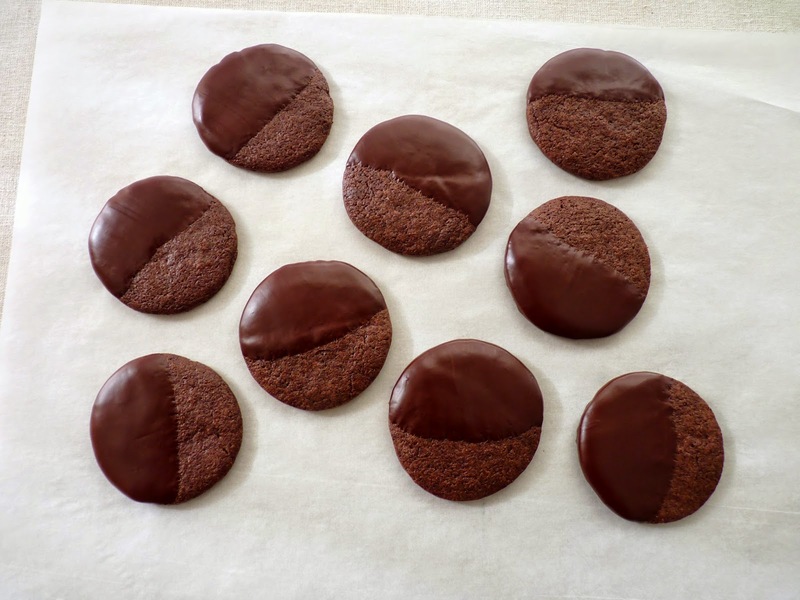 - You can either dip the cookies or use a small offset spatula to spread the chocolate. 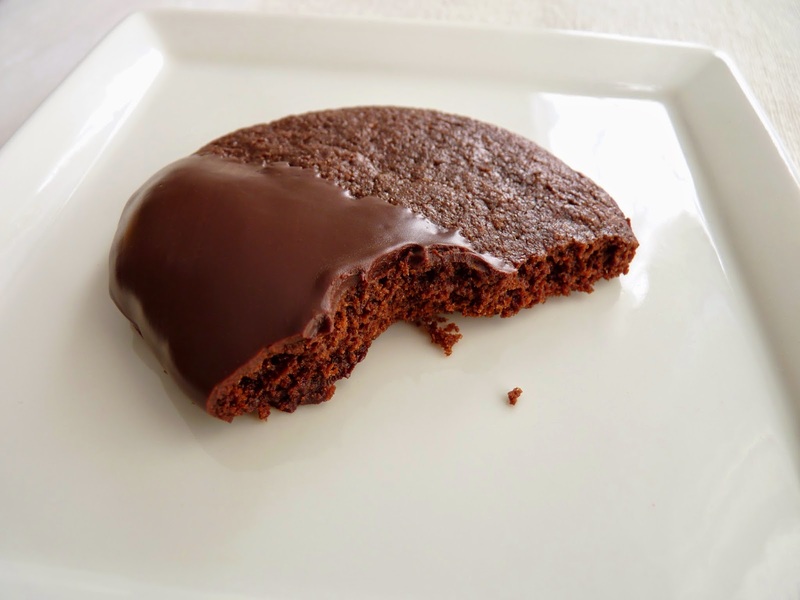 - If you want to dip the whole cookie in chocolate, double the recipe for the coating. - If you’re crazy about Samoas Girl Scout cookies, here’s my take on those flavors in the form of Samoas Ice Cream. - And speaking of oatmeal and peanut butter, these are really good: Oatmeal Peanut Butter Sandwich Cookies. 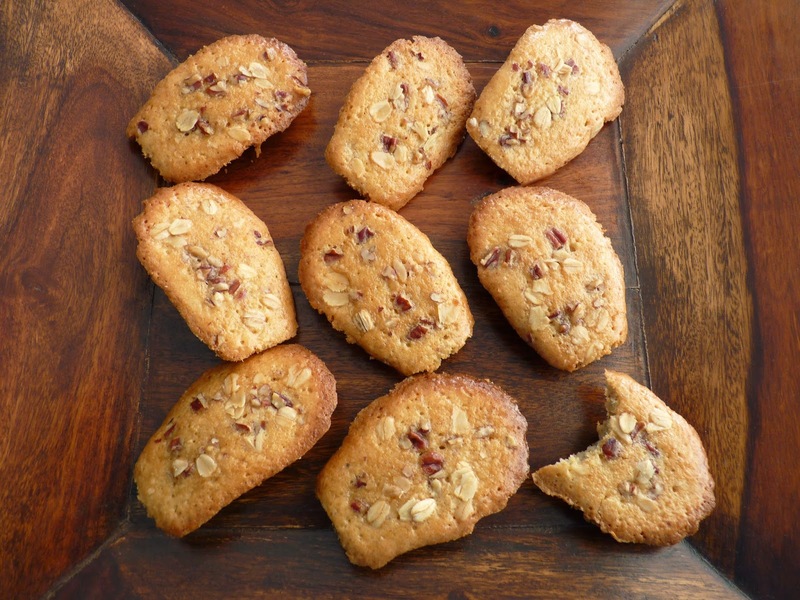 And if you like toffee bits in your cookies, this Almond Toffee Shortbread will certainly cheer you up. For a bold and delicious hit of mint and chocolate, try Mint Chocolate Ice Cream Cake. Place the flour, cocoa powder, sugar, salt and baking soda in the bowl of a food processor and process until thoroughly mixed. Cut the butter into 1/2” pieces and add. Pulse until the mixture looks like coarse meal. Combine the egg, milk and vanilla and peppermint extracts. Add and pulse the food processor just until the cookie dough starts to form clumps and holds solidly together when pinched. Divide dough in half and place each on a piece of plastic wrap. Flatten the dough, cover each portion with another piece of plastic and roll out to a scant 1/4” thick circle or rectangle. Place each one encased in plastic on top of each other on a baking sheet or pizza pan. Chill thoroughly. Remove the rolled out cookie dough from the refrigerator and carefully peel the plastic wrap off of both sides. Cut out cookies with a 2 1/2” cookie cutter and place on prepared baking sheets. Bake until the tops and edges are dry to the touch, about 13 - 15 minutes. Cool completely on a wire rack. Finely chop the chocolate and place with the butter in a heatproof bowl over a saucepan of about 1" of barely simmering water, making sure the bottom of the bowl is not touching the water. As the mixture melts, stir to combine. Add peppermint extract. Remove from heat and cool for just a couple of minutes or so. Dip each cookie in the chocolate for a nice thick coating, scraping the bottom of the cookie along the edge of the bowl to remove excess. Place on a silpat or parchment lined baking sheet to dry. For most people, time has become a supreme luxury. Time to linger over a delicious and wholesome breakfast, engage in fun or stimulating conversation, savor every last drop of your favorite freshly brewed coffee. We are often in a rush from the moment we awaken to the moment we drop off to bed for the evening. When we do find some extra time, we do our best to catch up on precious sleep, monitor the comings and goings of loved ones and perhaps even spend some good time in the kitchen. Weekend brunch is a good way to remedy all this. It’s a great time to relax and enjoy whatever promise the day may bring and prepare something fun and delicious that perhaps errs on the side of extreme pleasure. For me, this can mean some wonderful freshly made granola, fruit and yeasted pastries, a very nice coffee cake, biscotti, some scones or warm biscuits. 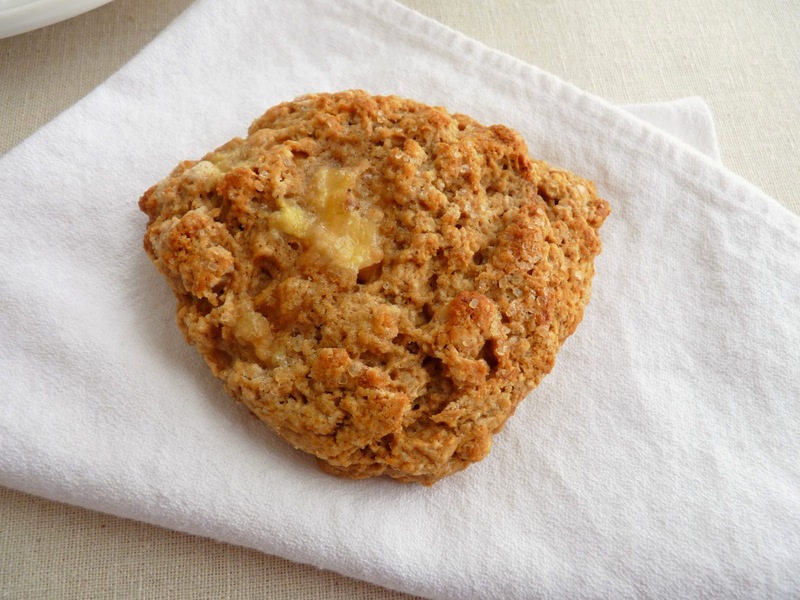 Today’s bake is a pretty simple but wholesome Banana Walnut Scone. Yes, this is another opportunity to take those ripening bananas and do something productive! It’s the usual scone mix of flour, sugar, leavening, butter and dairy to which I’ve added a couple of ripe bananas, a pinch of spice and molasses and some nuts. Whips up in no time, leaving you to relax and proceed to enjoy every precious moment of your morning. - Make sure your brown sugar is lump free or it melts in pockets, leaving holes in your finished pastry. 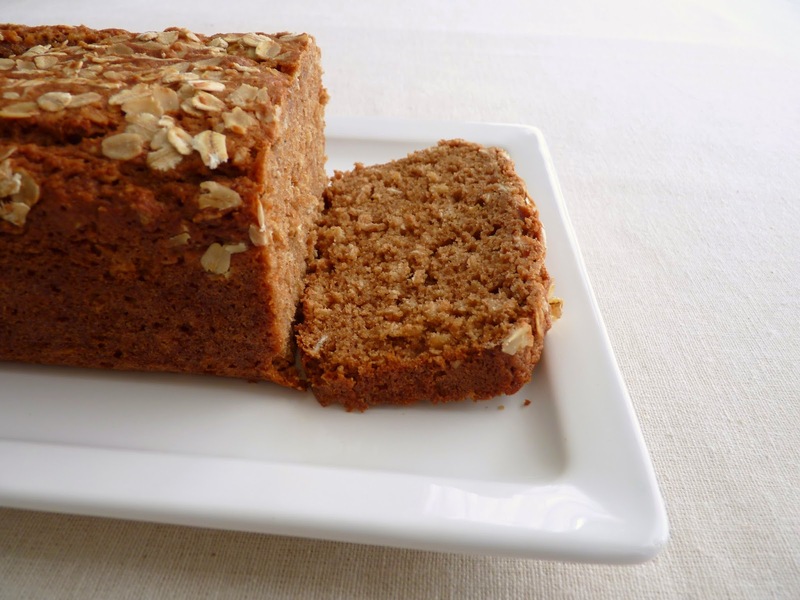 To prevent lumps, store brown sugar in an airtight container or place a piece of bread or apple in the bag. Some people say storing in a Ziploc bag in the freezer also works but I’ve never tried it. You’d need to bring it to room temperature because excessive cold will discourage the baking properties of leavening or yeast. - Do your best to handle the dough very little to ensure maximum tenderness. - More good brunch ideas. Preheat oven to 425 degrees F. Line a baking sheet with parchment paper or a silpat. Whisk the flour, granulated and brown sugars, baking powder, baking soda, salt and spices until completely blended. Mash the bananas, leaving some small lumps, and combine with the buttermilk, molasses and vanilla. Cut the cold butter into 1/2” pieces and add to the flour mixture. Toss thoroughly to coat with flour. Use your fingers to pinch the butter into small thin flakes about the size of a dime, tossing as you go to continue to coat the butter thoroughly with flour. 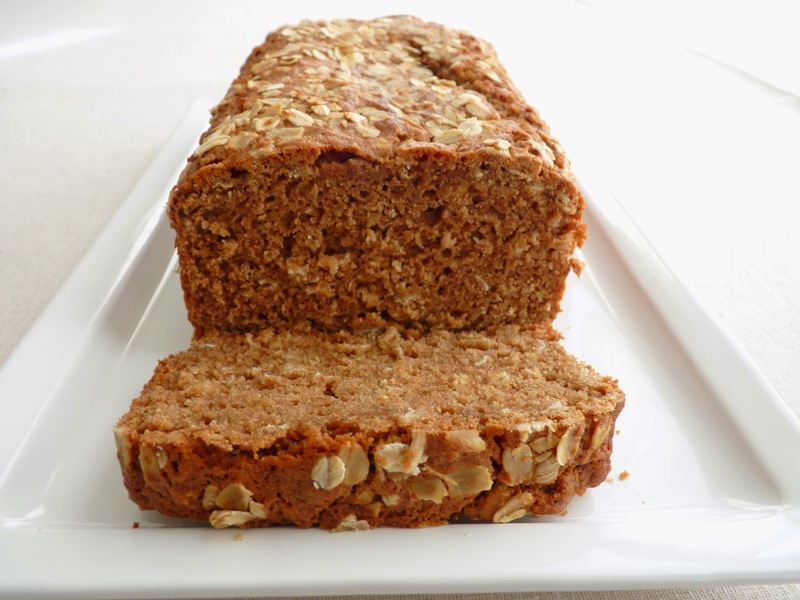 Make a well in the center and add the banana mixture and walnuts. Stir gently with a fork until it starts to come together and the liquid seems fairly absorbed. The dough will look a little shaggy. Gather the loose and lumpy dough and knead it very gently just 2 or 3 times until it holds together. Turn the dough out onto a lightly floured work surface. Gather and gently pat together into a circle about 7” in diameter and about 1” thick. Using a lightly floured bench scraper or sharp knife, cut the dough into 8 equal wedges. Lift them with a metal spatula and transfer to the prepared baking sheet, spacing them about 2” apart. Brush the tops with melted butter and sprinkle generously with cinnamon sugar. Bake until firm to the touch and golden brown, about 14 - 15 minutes. Transfer to a wire rack and cool. After a lush season of holiday meals, appetizers, drinks and desserts, it may be a good time to get back to basics. And by basics, I mean a simple loaf bread with a bit of oatmeal, whole wheat flour, applesauce and spice. 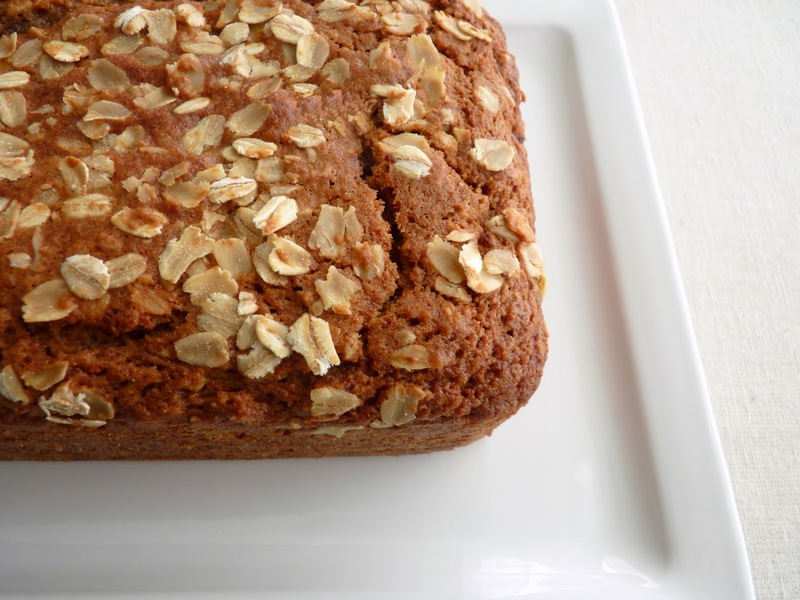 This recipe for Applesauce Oatmeal Bread comes from King Arthur Flour. Although it may sound plain, it’s a delicious and wholesome taste that’s super easy and quick to produce. It’s hearty without being heavy, moist without being oily. You could also bake the batter into muffins for a breakfast or brunch treat. As we contemplate the New Year, let’s be sure to work some delicious meals into our everyday lives. Although my focus here is pastry, I firmly believe in a healthy and balanced diet with plenty of fresh vegetables and fruit and lots of water. We must be good to ourselves! Thanks for another year of fun pastry and desserts. I truly appreciate all the lovely support of my work. Here’s to a happy and healthy 2015 full of fresh opportunities. - I did change the recipe up just a bit. I used 1/2 cup granulated and 1/2 cup dark brown sugar and King Arthur Whole Wheat in place of the White Whole Wheat. I also used 1/4 cup oil + 2 oz butter, melted, for a bit of a flavor boost. - I left out the walnuts but I’m thinking this would also be good with sunflower seeds. - For muffins, check them at 20 – 22 minutes. Makes 1 dozen. Preheat oven to 350 degrees F. Lightly grease a 9" x 5" loaf pan and line with parchment large enough to form an overhang along the length of both sides of the pan. Sift together the flours, baking powder and baking soda, salt and spices. In a separate bowl, whisk the oil, sugar, eggs, oil, applesauce and vanilla. Add the flour mixture and whisk just until blended. Mix in the oats and walnuts. Pour the batter into the prepared loaf pan. Bake until a toothpick comes out clean when tested in the center of the bread, about 55 – 60 minutes. Place on a wire rack and cool for 15 minutes. Gently lift the bread out of the pan using the parchment overhang to assist. Remove the parchment and cool completely.